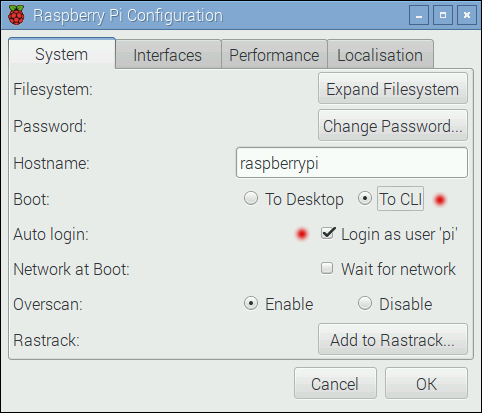 How to automatically login to the Raspbian operating system on a Raspberry PI. Choose to log in to the command prompt or the graphical desktop without the need to enter a password. Automatically logging in is useful when using the Raspberry PI as a console/kiosk or to run a dedicated application that must auto run at start-up. In previous versions of Raspbian, the inittab file had to be modified to auto log in. Because of changes to the operating system, Raspbian Jessie no longer has an inittab file in /etc/. With the inittab file gone, the auto login settings can now be changed in the Raspberry PI configuration dialog box as explained in this article. A new installation of Raspbian Jessie automatically logs in and starts the graphical desktop when the Raspberry PI is powered up. Login settings can be changed easily from the desktop. From the Raspbian desktop, choose Menu → Preferences → Raspberry PI Configuration by using the main menu button at the top left of the screen. The Raspberry PI Configuration dialog box opens with the System tab selected. To automatically boot to the command line interface (CLI) at power-up, click the To CLI radio button and make sure that Login as user 'pi' is checked as shown in the image below. If Login as user 'pi' is checked, you will not have to enter a user name or password when the operating system boots. Selecting To Desktop will boot the Raspberry PI to the graphical desktop. Selecting To CLI will boot the RPI to the command line interface. The default of the older Raspbian editions was to boot the Raspberry PI to the command line and require a user name and password to log in. This can be set by unchecking "Login as user 'pi'" and selecting "To CLI". If you do enable the PI to boot up and require login, don't forget that the default user name is pi and the password is raspberry. To start the desktop if settings are changed to boot to the command line, enter startx at the command prompt to start the desktop again. The following video shows how to change from the Raspbian Jessie default of auto login to the desktop to auto login to the command prompt.